If you're anything like me, you do most of your work on your phone or need for it to be accessible on your phone at all times. 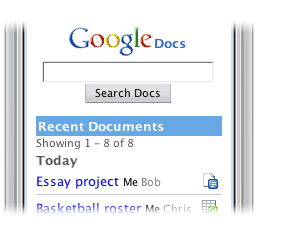 Enter google mbile apps, recently i was introduced to google docs and being an excessive blackberry abuser,decided to find the mobile app for it (m.google.com/docs). Save yourself some time and headache, just go to m.google.com on your phone's browser and get all the mobile apps,from calendar,news, gmail or even latitude if you care to let people know where you are at all times.